April (Seattle’s Easter Swing) marks the 15-year anniversary of our dance partnership! 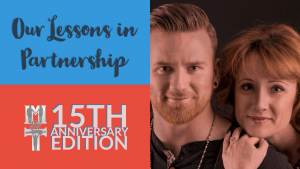 As a rare breed of Champion couple who has been able to make a dance partnership AND romantic partnership work, I thought it might be nice to honour it by sharing the lessons we have learned along the way. Every couple has a different timeline, a different landscape to their story: some were in a relationship first before they started partnering. Some were partnering virgins before they met. Some partnerships enjoy a completely platonic arrangement. Some partners have tried at a relationship and decided against it, while others have decided to make their relationship the priority. I don’t propose advice for every circumstance, only to explain the lessons we have learned that seemed to have worked for us. Of course, many of these skills crossover from partnership to relationship and vice versa. The inspiration for this article comes from Rising Stars who are asking for advice in navigating the waters of a new partnership. 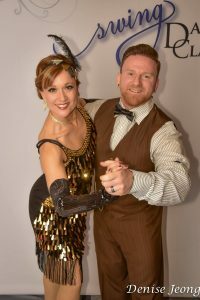 Myles and I met in 2001 when he started coming to our fledgling Vancouver WCS community as an established Champion dancer to teach workshops. Our friendship blossomed, and in 2002, being inspired by the routines at Seattle’s Easter Swing, he asked me to be his dance partner. 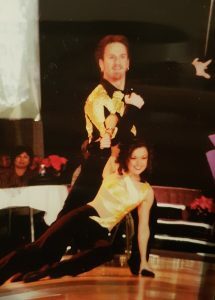 As a promising young Novice dancer with 3 points to my name at the time, I was beyond honoured and giddy to accept the invitation to do a Classic routine, but almost peed my pants when he corrected me: he wanted to do Showcase. At that point, I was so afraid of heights, we had to go to a gymnastics studio to train so I could be strapped into a trapeeze harness just to learn how sit on his shoulders! 6 months later, he made the decision to move from Calgary to Vancouver to further his dance career, and we finally admitted our partnership had become something more. 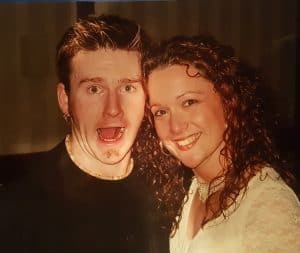 With my first Champion points in 2004, we officially became Canada’s first WCS Champion couple. 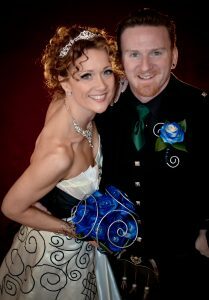 In 2006, we moved in together and took home our first 1st place Showcase trophy, and got married just after our 10 year anniversary in in 2012. While the order of these topics is random, I feel compelled to put Communication first because it really is the #1, fundamental, top priority, essential skill that affects all the other topics. To this day, we are constantly working on our communication skills. Communication is so often taken for granted: we assume that we graduate from school with enough communication skills to survive and thrive, but in actuality, this is only the beginning. You could have the best intentions, but if you can’t communicate them effectively, they are misinterpreted and your goals are compromised. We were lucky to have the opportunity to get direct training from Landmark Education in 2004, which established the framework for our relationship and partnership communication (highly recommended). We continue to use and develop these skills as a daily challenge for us – I don’t mean a daily struggle; more like daily homework. We consider ourselves humble students of the art of communication, but far from experts. Rookie tip: Just because your communication is messy in the beginning, does not mean it won’t improve or that the partnership is doomed. Train your communication skills like you train your dance skills: never stop growing! Just as in a relationship, you need to make sure you know your partner’s motivations and goals before committing to align with them. If you’re not on the same page, one of you will inevitably be disappointed. Myles and I talked about our goals early on, but it was several years in before we actually had the conversation about motivations. We used to get disappointed with our competitive results, but not because we actually cared about placements – only because we cared that other people cared. 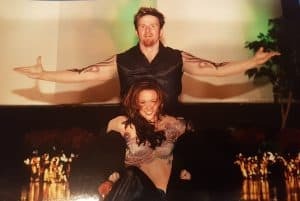 When we had an honest conversation in 2008 about why we do Showcase, we discovered our true, unbiased motivations: Myles craves the emotional connection with the audience. He thrives off of sending and receiving their energy via his performance. For me, the thrill is in being fully expressed – accurately depicting what’s in my brain – having our choreographic vision understood. Both of us share the motivation of being innovators and pioneers: we care more about being *the first* to accomplish something than we do about placing first. Placing first doesn’t taste as sweet when our goals have not been met. When we discovered that our primal drive to dance in Showcase was not placement-based, we felt a new sense of freedom, relief, and unison. Rookie Tip: Be honest with each other about your motivations so you can course-correct when you get off track. Goals and motivations are flexible not fixed. Be sure to re-evaluate periodically. This goes beyond just labels of leader and follower. Our routines have a relatively unique quality of having the majority of movements authentically lead. Many routines look great but don’t feel great because the dancers simply execute the agreed upon choreo by themselves. They don’t appear “connected”, and the movements are largely synchronized and touching, but solo. Maybe we work too hard and this quality is not rewarded well enough to deserve our effort, but we feel compelled to be true to the feel of the dance. Of course, there are some moves that are not socially leadable, but these are exceptions. Whichever method you choose for each chunk of choreo, you need to make sure your partner is on board. If you are executing a movement solo that your partner thinks is supposed to be initiated/controlled/lead by him, there’s going to be detectable conflict in your movement. This can lead to conflict in practices and performances. See “Conflict” below. Rookie tip: try leading a piece of your choreo with a partner of equal skill level who does not know your routine. They will be able to highlight missing or inauthentic movements. Disappointment comes from unmet expectations. If you change your expectations, you are likely to avoid disappointment. This sentiment sounds obvious, but it really deserves to be ruminated on. If I expect that Myles will counterbalance me in a particular move, and he does not, I will feel disappointed like he let me down. I would be correct in blaming him only if we had already agreed that he should provide counterbalance. But if I am the only one who thought that counterbalance was owed to me, I have no right to blame him. Our expectations did not match. Outside of your partnership, it’s important to be realistic with your expectations in our competitive world. Remember by signing up for a dance contest in WCS, you are agreeing to subjective judging with no set criteria. This is the nature of the game you are invited to play, so if you agree to play the game, you have to accept the terms. If you have expectations that don’t match the terms of the game, you will only upset yourself. If you enter a contest without expectations that have not been promised, you will be satisfied with any result. Rookie tip: state your expectations to your partner out loud: “My expectation at this point in the move/task/conversation is that you will ____”, so you both can discuss and negotiate as necessary. 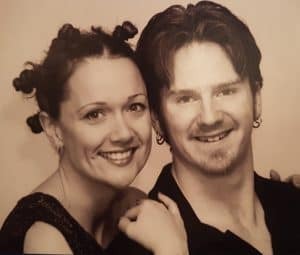 We struggled early on to be productive in our business – I’m talking about the non-dancing aspects of our partnership, such as answering emails, negotiating contracts, making flyers, and cutting music. Let’s just say we had grossly differing skill sets. It was not enough just to divide the administrative tasks equally between us. We needed to consider each others’ strengths and weaknesses and quit forcing each other to do tasks that the other was better at. Yes, there is an advantage to stepping outside your comfort zone to learn something new, and a learning curve to be respected, however you have to weigh these against the efficiency and efficacy of the task. After some frustration and hard lessons learned, we decided that I would handle all communications (website, marketing, etc) and Myles would be responsible for all technical things (music cutting, video production & sales, electronics purchases). I book the flight travel and he books the ground travel. We each book our own private lessons – we never book lessons for each other. He cooks, I clean. Rookie tip: If you teach together, extend this concept to your teaching roles as well: who manages the music, who does your introductions, who talks more on the video recap, etc. This advice sounds cliche, but the issue isn’t always about the “not sweating” part – it’s about knowing which stuff is actually small. Putting things in perspective is hard to do in the moment, especially when it seems like an indicator of a bigger, more pervasive or daunting problem. Example: a judge giving you a bad score once: small deal. A judge consistently giving you bad scores: big deal – something you should take action on, such as asking them for feedback. Example 2: having a bad performance in front of a non-WCS crowd: small deal, it is unlikely anyone would be able to notice the difference or care. Having a bad run at a large WCS competition with an educated audience: big deal. One strategy that has helped me is to note how little you remember about individual performances as soon as the weekend is over. Sure, there are the memorable ones where a couple debuts and knocks it out of the park, or catastrophes like losing a shoe, but besides enjoying the show as a whole, as soon as you leave the event, do you remember each couple’s dance? Not really, which means the audience is not carrying around your performance failure in their heads, and neither should you. Rookie tip: In order to put things in perspective, think about where you were a year ago, or with your partner: immediately list 3 things that would have been a big deal that did *not* happen. Even after 18 Showcase routines, we are constantly learning, growing, and morphing with this ever-evolving dance. We like to show our diversity and range by choosing a genre each year that is polar opposite from the previous year. This is not advisable for all couples, but I do recommend experimenting in the first few routines to find the genre that suits you best. Choreographing for ourselves (not for others) is easily the biggest strain on our relationship. If we could go back to our first routine, we would definitely make different choices – costume, music, swing content, etc, which is why we always recommend that Rising Stars have their choreography done by a professional – at least the first year. There are so many variables to consider that it just makes sense to leave the design up to an expert so you can focus on your partnership. Then in subsequent years as you gain experience and you “break in” your partnership, you can start trying to transition to choreographing on your own. We’ve had our share of arguments! You should have seen us in the first few years of our partnership – never violent, but our weapon of choice was screaming. Screaming out of frustration, sometimes. But mostly screaming to be heard. In other words, the source of our arguments was a lack of listening. I can’t even remember how many times we have had massive arguments over something that one of us thought they heard but was never actually said: “Wait a minute. You wanted me to move my LEFT arm faster? I thought you said right arm.”. We have learned over the years (and continue to work on) HOW to listen, how to ask for listening, how to check for listening, and how to recognize the difference between a misunderstood message and a conflicting opinion. The #1 topic we would argue about? The rules of arguing. Ironic, right? Bottom line though, is that winning an argument is not the same as winning. We still have to remind ourselves to prioritize finding a solution over “being right”. Rookie tip: It’s a good idea to have a plan for conflict – an agreement of how to manage emotions in the moment: finding a private space, paraphrasing before debating, giving yourself a cooling off period, or maybe calm, transparent divulgence of feelings. It helps to establish these agreements either proactively before arguments start, or at least after we both have calmed down enough to debrief. It’s easy to see the trust Myles and I have on the floor – it’s palpable with every lift. But trust is equally important off the floor. Even though Myles is a grown adult who can set his own alarm clock, he knows that if he sleeps in for whatever reason, I will wake him up so he doesn’t miss his (lesson, flight, comp, etc). He’s not depending on me, but he can if he needs to. Everyone has their own set of triggers that set them off. Some things that piss me off do not bother Myles in the slightest. Sometimes Myles will get upset at something and I happen to have the cooler head in that moment. Whoever is calm owes it to the other person to take the lead and be the voice of reason. Whoever is upset needs to agree to yield to the calm partner and let them take leadership. This is especially necessary in professional or customer service situations. On the dance floor, if one partner is experiencing a breakdown (forgetting choreo, missed a hand, slipping on the floor) the other needs to tune in and provide support as necessary. You owe it to the team to not leave your partner to struggle. If you let the team down, you lose too. Having your partners’ back is not just good friendship, it’s a teamwork requirement. Rookie tip: when the moment has passed, be sure to acknowledge your partner for having your back. This identifies and reinforces desirable behaviour, shows appreciation, and opens a discussion of how to prevent similar issues in the future. Commonly heard in relationship advice, this is even more relevant in a partnership. While you both enter the partnership with different skills sets, it’s important not only to find a way to merge, accommodate, and compliment each others’ skills, but also to grow independently. We have sought out cross-training in: adult jazz, ballet, hip hop, pole dance, aerial silks, Lindy Hop, Balboa, Ballroom, Adagio, and Cirque. We have also developed the hobbies of motorcycling and SCUBA together; Myles’ is into jiu-jitsu, Crossfit, and now golf, while I maintain French, Yoga, and (obviously) writing. We have found that not only does focusing on hobbies outside of dance keep us balanced and sane, but quite often we learn lessons that we can apply back to our dancing. Rookie tip: actively seek out growth and cross-training opportunities you can do solo and/or together. Alpha and Jen, a platonic partnership of 6 years, got all nerdy with their arrangement and actually started a collection of agreements that would make Sheldon Cooper proud. They include clauses and expectations on topics such as: feedback structure and language, unsolicited advice, off-limits conversation/feedback topics, practice scheduling, etc. They add to the document as their partnership evolves and new scenarios emerge. Do you and your partner have a partnership agreement? I would love to hear from you what items are on your list, or what lessons you have learned from your partnership experience! Feel free to comment below. That is so inspiring – thank you for sharing a slice of your life. And congratulations on your anniversary and here’s to another 15 years! Just reading this makes my partnership stronger. To hear that another couple has struggled with the same issues we struggle with, successfully, is so very reassuring! Partnering with your significant other is so very hard! But I couldn’t imagine partnering with anybody but her. Thanks for this entry! Know when to choose your battles. I’m sensitive to people’s energy so I can tell right away if someone is stressed, angry, etc. As soon as I can sense my partner is upset I find a way to help us reset so it doesn’t hinder practice by causing a downward spiral. When one or both of you is upset that is not the time to push them. There’s a difference when they push themselves to learn difficult choreo and being pushed when you’re not in a space to handle it. Don’t create problems that aren’t there. Walk away, and choose your words. It’s inspiring to read many of your articles. As an older adult just celebrating a milestone at 70 I can’t help but admire how you both love and have enjoyed dance over your many years together.. Much of what you focus on has broaden my understanding of what is necessary and hopefully a purpose to continue my journey in a dance that moves me to embrace others in a dance of life which had escaped me over the years. Thank you both for being who you are and continued success..